The Russian company Caviar is known for its flashy modifications of flagship devices. Following the announcement of the new iPhone X, along with the iPhone 8 and the iPhone 8 Plus, the online retailer launched its new luxurious series. Now the Apple flagships come with titanium bodies, inspired by the MiG-35 jet-fighter, the Satan ICBM, and the T-14 Armata tank. Caviar offers plenty of options for luxurious personalization. 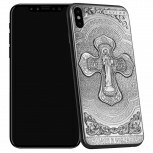 For example, the back panel of the new iPhones can be plated with a golden coat of arms of the country of Kazakhstan, Armenia or Chechnya. The Love collection includes purple-leather back with blue Josephine diamonds, and of course, there are several golden plates of Vladimir Putin and Donald Trump. One of the new modifications Caviar offers is an iPhone X with actual Seymchan meteorite stone from the Russian region of Magadan. The bizarre collection comes at a hefty price. One of the cheapest options is iPhone 8 with black onyx for RUB179,000 which is around $3,000. The meteorite-coated iPhone X would set you back RUB244,000 or $4,500. For comparison, the regular retail prices of the iPhone 8, iPhone 8 Plus and iPhone X in Russia are respectively RUB56,990 ($986), RUB64,990 ($1,125) and RUB79,990 ($1,385).